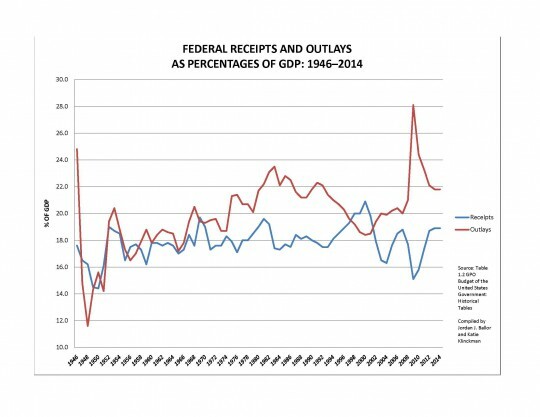 In the discussion of whether the problem with our national public debt is a question of receipts, outlays, or both, I linked to a helpful set of graphs from Anthony Davies, an economics professor at Duquesne University. This data shows that even though a variety of tax rates have changed a great deal over the years, the federal government has basically taken in receipts within the range of 16-20% of GDP over the post-WWII era. If you haven’t looked at this presentation before, you should do so now. There used to be some correlation between the red and blue lines. But not in today’s Washington. Again, given this historic perspective, I think it’s hard to blame the blue line for the current debt levels. Keep in mind too that since these figures are a function of GDP, as the economy grows, other things being equal so too does the spending and receipts of the federal government. In addition to the larger versions of the graphs clickable above, you can download this set of graphs in PDF form here, and visit our “Principles for Budget Reform” page to read more related commentary.